Summon: Draw a card if you have two other creatures. Sightless Skulk is a common Agility creature card. It is part of the Heroes of Skyrim expansion. 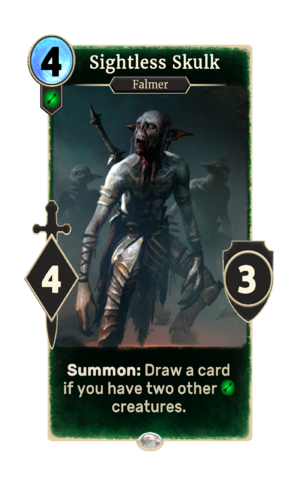 In addition to the card's availability in the Heroes of Skyrim expansion, two copies are included in the Brynjolf's Heist theme deck, and one copy in the Paarthurnax's Roar theme deck. This page was last modified on 24 September 2018, at 23:17.